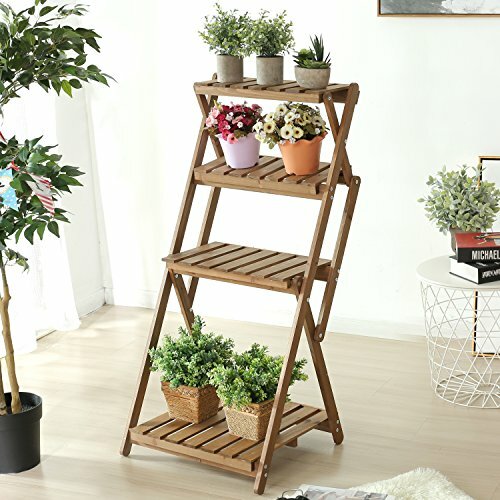 Versatile for use both indoors and outdoors, this 4 tier wood plant rack has a rustic style and functional design that makes it well suited to displaying potted plants on a patio, or showcasing photos or curios inside. The 4 removable platforms feature a slatted design for quick draining outdoors, and the frame can be folded with the platforms removed to make for compact storage when not in use. This garden shelving can be used for a myriad of purposes, from holding towels poolside, to adding useful organization to a closet, to serving as rustic shelving in a kitchen or living room. Approximate Dimensions (in inches): Overall - 42.3 H X 21 L X 19.1 W. Shelf (top 2 shelves) - 17.1 W x 7.2 D; 3rd shelf - 10.2 D; Bottom shelf - 17.3 D.
Versatile wooden plant stand can be used indoors or outdoors. Removable shelves and foldable frame allow for compact storage when not in use. The stair-step design features 4 tiers. Can be used to hold potted plants as well as other decorative items. **Plants not included. ** Approximate Dimensions (in inches): Overall - 42.3 H X 21 L X 19.1 W. Shelf (top 2 shelves) - 17.1 W x 7.2 D; 3rd shelf - 10.2 D; Bottom shelf - 17.3 D.